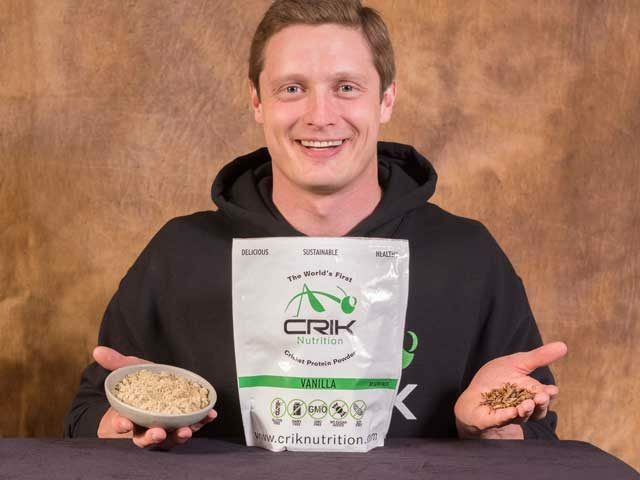 Alex Drysdale, owner of Crik Nutrition, started his business in 2015 after looking for a cricket based protein powder for personal use and found no products. That same day Alex ordered some crickets and once they arrived he began to experiment. “I was like a mad scientist in the kitchen, and found my idea was viable”, Alex says. He immediately started working on a plan to develop a cricket based protein powder which is now sold online. Crik Nutrition will soon release a chocolate flavor powder, in addition to the vanilla one currently available in the market. Alex is also looking into developing multivitamins and other health products using crickets. Crik Nutrition draws on resources from Canada, including the crickets themselves, which come from a cricket farm near Toronto, Ontario that raises crickets for human consumption. Crik Nutrition is located in Stony Mountain, Manitoba. Alex has chosen to develop his business in rural Manitoba because that is where he is from. For Alex it is easier to stay focused in a rural setting and since he is selling his product online, he can continue to maintain his business outside Winnipeg. An Online business has enabled Alex to cut his overhead and enter the market in a competitive position comparable to larger companies. Alex indicates the “biggest challenge in any new thing, if you are striking out on your own, is going to be yourself” but he has overcome this challenge by constantlyreminding himself what he wants and why he is doing what he is doing. “In the end you are going to be the only one who will stop you.” Crik Nutrition has benefited from Manitoba’s climate of innovation and entrepreneurism. Innovate Manitoba, Futurpreneur and the Eureka Project have all helped Alex take his business to the next level. “Jump in feet first, set a huge goal and have faith in it and jump… Just do it, any action is better than over planning with no action”.